Tibor Érdi Jr secured a second consecutive win in the FIA European Rally Championship’s ERC2 category on the EKO Acropolis Rally, but late drama behind decided the remaining podium positions. Russian Performance Motorsport’s ERC2 representative, Sergei Remennik, finished in second position come SS12, but his 16m44.0s gap over third place belied a nail-biting finish to the production class podium battle. Juan Carlos Alonso was on a charge up the field after a 1m40s penalty sent him back to fourth position on Saturday night. He won both of Sunday morning’s stages, leapfrogging Q8 Oils Rally Team driver Petros Panteli into third place before midday service. 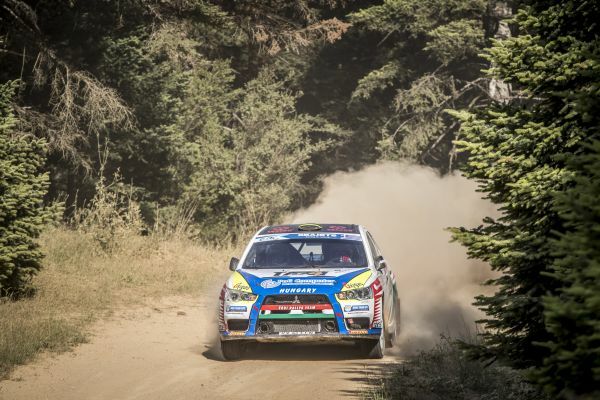 “We are fastest in two stages, and we try to push to get second place. Two stages to go, it’s a very difficult rally, anything can happen,” said Alonso, foreshadowing what was to come. Heading to SS11 Alonso’s gap to Remennik was a mere 8.6 seconds, aided by a spin for Remennik in SS10 which had cost him vital time. However, Alonso’s charge for second place would end shortly afterwards, rolling his Mitsubishi Lancer at a tight right-hander and retiring. With Remennik’s position safe, Panteli picked up third place once more, but the Acropolis held one last twist for the last stage of all. Panteli’s Lancer suffered a mechanical failure midway through SS12, pulling over to allow his car to cool down before resuming. That stoppage cost him 15m39.5s compared to Zelindo Melegari behind, who had struggled all weekend with technical gremlins and subsequent time penalties for lateness. Their efforts to retain third fell short by the smallest of margins as Melegari overhauled Panteli for third position by only 10.8s. “I do my maximum to arrive at the podium. [It’s a] good result because first day is hard, and second day is worse! But we are here,” Melegari told ERC Radio at stage end.